If revival were to break out in another country, would you go? Many of the people I met at the Florida Outpouring had come from all corners of the world. They paid their way, invested time and money, and made major life changes to see what God was doing. Give us your revival opinion on our Revival Opinion Poll! Our brains cannot feel pain. They cannot, in fact, feel anything. It is pure objectivity for ourselves. Though we can feel our body, it is usually in the context of pain only; when some invasion into the system occurs we can feel it. However, a large degree of that same objectivity expands to encompass our bodies. Sometimes, that objectivity can even include our mirror reflections. However, show us a picture of any particular body part or a video of us moving and we experience extreme disassociation. We have all had the experience of hearing our own recorded voice and not recognizing it. Sitting here typing, my tapping fingers are a part of me, but I do not experience them in the way I would experience another’s tapping my arm. This experience causes us to not know ourselves. We all ask “who am I” and “why am I here”. These are questions that result from our inability to experience ourselves. In searching for God, in searching for relationships, in joining gangs and cults, we are searching to answers these questions. We were created to not experience ourselves, which means we seek to gain context. The thing about context is that it is about location AND meaning. Whenever we find false identity, we find it in these two things. Our purpose and our place (in both space AND time) satisfy this. With community, especially CHRISTIAN community, we gain context by the person sitting across from us. That person is not only an immediate answer to location and purpose (they are looking at us and our service to them gives us great purpose). They represent God in the Body, eternally confirming location and purpose; our divine purpose in the intended location He placed us. We not only need the Body for ephemeral reasons. We need the community for psychological affirmation. We need the Body to affirm what we suspect God has for us. The community gives us context. After day 100, the ministry team with Fresh Fire definitely needed some R & R. As the Florida Revival in Lakeland continues, Todd Bentley has taken some time off. Roy Fields has also had powerful stand-ins. Andrew Phillips and Jillian Roberts led worship Thursday at the morning service at Ignited Church. Then, they both assisted during the evening service. From there, worship leader Jillian Roberts went on to lead worship at the morning service. You can check out some of the worship here. (Go to this link. Then select July 10th.) Please be praying for the ministry team at Fresh Fire to be renewed in Christ, as well as for direction that the revival should take. ALSO, as a note, revival has begun in the local area as well. At City Church of Tampa in Brandon, Florida, just a half-hour drive from Lakeland, revival has begun. Pastor Kent Davis brought in Terry Kruse and there has been powerful visitation from God. A totally different flavor of revival from that in Lakeland, FL, the revival at City Church of Tampa has been profound with Financial Breakthroughs, Spiritualy Breakthroughs and so much more. The services are just Thursdays and Sundays for now, but plan to extend. Check back for more! Todd Bentley was recently interviewed by Geraldo Rivera on Fox News about the Florida Revival in Lakeland, Florida. I was very impressed at the way Todd replied to the questions put to him about offering doctor-verified evidence of healings, accountability for his finances and such. Geraldo offered that if Todd were to produce evidence of healings and integrity on the finances that he would get behind Todd Bentley, Fresh Fire ministries, and the Florida Outpouring. It was a powerful interview. Also, last night Todd mentioned that he saw the glory, liquid, honey cloud of God’s presence. I love this description of what God is doing. Finally, here is a letter Todd Bentley wrote the critics of the revival. The tone is positive and the theology is fairly strong. It has been almost 2 whole weeks since we have updated you on the powerful move of God STILL GOING ON HERE IN LAKELAND, FLORIDA! Last night we visited and found another 3,000 – 4,000 people passionately pursuing God. 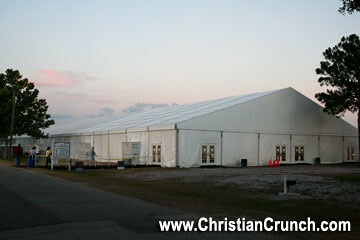 Todd Bentley and the Fresh Fire team from Vancouver, British Columbia has set up a semi-permanent tent to house over 10,000 people. Roy Fields continues to lead the masses into heart-felt worship, touching the hem of the Holiest of Holies. Todd was not there last night, but will be back on today. Check out the new photos from last night at this link. We could hardly leave off of worship. There was a spirit of holiness and worship that the crowd led. David Thomberlin kept trying to move the service forward, but the presence was too much. Also, there was a surprise visit by John Arnott and his wife, Carol Arnott. 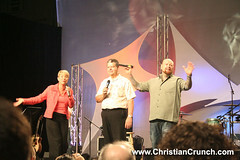 John and Carol Arnott of the Toronto Blessing in Canada came to soak in the anointing and bless the revival. Todd Bentley was highly encouraged by them coming as generals of God from previous outpourings. Along with that, there were powerful photos of the people from all walks of life coming to worship Jesus and get a touch from God. Check the latest florida revival photos out here. You can view ALL OF THE FLORIDA REVIVAL AND HEALING OUTPOURING PHOTOS AND PICTURES here. You are currently browsing the archives for the Christianity category.